ZuluTrade connects traders (aka signal providers) with investors. The investor’s money is kept in the broker account used to connect to the ZuluTrade social trading platform. Hence liability is with broker and to make sure your money is safe you would need to validate the broker’s financial stability and how they are regulated. There are over 60 brokerages connected to the network (eg AvaTrade). ZuluTrade shares revenue with Brokerage partners which is then also shared with the signal providers. ZuluTrade also have their own brokerage called AAAFx. Through being fully integrated they will experience reduced slippage compared to other brokers. AAAfx is registered in Greece and fully compliant with all EU regulations. The spread and leverage allowed will be determined by the broker you are trading with. 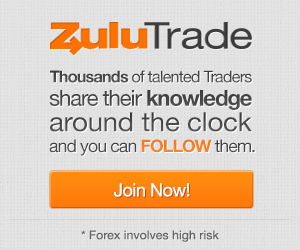 ZuluTrade charges 1 pip per trade to brokerages that place trades on the social trading network. The signal provider will be paid by ZuluTrade 0.4 pips for each live trade executed by a follower. Commissions charged to the end user will vary from broker to broker. Some will not pass the full 1 pip amount, sacrificing it for the increased volume introduced by ZuluTrade. Some brokerages will charge more than the 1 pip commission, in order to cover the costs of integrating their service with ZuluTrade. AAAFX is a fully integrated subsidiary of ZuluTrade and therefore does not charge any commission at all to the end user (they in turn are not charged for using ZuluTrade). AAAFX, also experience a lot lower slippage rates than other brokers due to their being fully integrated. So serious consideration should be given to using AAAFX as your broker if you want to use ZuluTrade. The bonus and promotions for new accounts are offered by the brokerages with whom you fund the account. “Customer service desk available 24 hours, Monday to Friday via Email, Phone and Live chat. The trading platforms provided are ZuluTrade Forex and ZuluTrade Binary (for Forex and Binary respectively). They are available on desktop and mobile and tablet. They offer a demo account as well a live account. As noted above your funds are held with the brokerage you use, and not ZuluTrade. ZuluTrade’s integrated broker AAAfx offers accounts in EUR, USD, JPY, GBP, AUD, RUB and CHF. Other brokers allow you to keep accounts in other currencies. Economic Calendar – Provides upcoming events that could impact the market. TradeWall – 24-Hour signal provider information, showing what has been traded and by whom. Simulate – Provides you with hypothetical performance results by using historic data. Specify scenario and validate how it would have done using historic data from specified traders. Pip Calculator – Provides conversion between Lots and Pips. Currency Convertor – Converts values between different currencies. Margin Calculator – Calculates margin required based off number of lots traded, and margin ratio (ie leverage).